Johannes (John) Pauly was born in Norka, Russia on September 13, 1883, the son of Johannes Pauly (born 1861) and Katharina Christina Schwindt (born 1863). John's father owned the brickworks in Norka. The Pauly's built their own home, one of the few baked brick houses in Norka. As the eldest son, John was required to serve in the Russian military. According to family lore, he was trained in the same manner as the Cossacks. During an insurrection against the Czarist government in St. Petersburg (probably in 1905), John's skull was grazed by a bullet. He survived the ordeal but it caused him to think seriously about whether his future would be in Russia. Storm clouds were gathering over the empire and revolution was coming. John returned to Norka from his military service sometime in 1906. He decided that it was time to marry and he knew the girl with whom he would spend the rest of his life. At the time, it was customary to have an intermediary make marriage arrangements between the bride and groom's parents. Pastor Stärkel from Norka was chosen for this role. In the fall of 1906, Pastor Stärkel presented himself to Mr. and Mrs. Henry Hamburg to express the desire of John Pauly to marry their daughter Katharine Maria (Katie). Henry was a successful flour miller in Walter, Russia. The proposal was accepted and John was engaged to Katie on October 6, 1906. They were married on November 14, 1906 in Norka by Pastor Stärkel. Katie was born in Walter Chutor (Neu-Walter), Russia on December 14, 1884. Her mother was Amalia Kechter. As a young man, John worked as the manager of the family brickworks for no pay. His father told him to ask for anything he needed, but John was reluctant to request money. When time came for John to return to his service in the Russian cavalry, he decided instead to emigrate with Katie. He borrowed $200 from his brother and used the money to purchase transportation to the United States. The entrepreneurial skills he learned from his father would serve him well in America. John and Katie arrived at Ellis Island on November 12, 1907 aboard the steamship United States which sailed from Libau (now Liepāja, Latvia) on October 21, making an intermediate stop in Copenhagen, Denmark en route to New York. Also aboard the ship were other Norkans, including two Krieger families, Philipp Schmer and George Deines. From New York the Pauly's traveled by train to Detroit where they stayed about one year before deciding to move to Portland, Oregon. From Union Station in Portland they took a ferry to the east side of the Willamette River where they knew many Volga Germans were living in the Albina area. All they had was $10 and their wicker luggage. As John and Katie walked along the east bank waterfront in lower Albina, they encountered a fellow Volga German named Henry Wolf who spoke to them in their dialect. Henry had just emerged from a local saloon and told John and Katie that he'd just lost his renters and he would welcome them to move into his house. The next morning, John heard that work was available at a sawmill in Sellwood. He woke at 4:00 am and walked 8 miles to work. At the end of the work day, everyone went home except John. He kept working until the owner told him he had to go home. (At the time of the 1910 U.S. Census the Pauly's were living at 434 E. 7th Street N - now 2114 NE 7th Avenue). John walked home each evening saving the 5 cent streetcar fare, a sizable part of his daily wage of 50 cents. Thriftiness paid off as John and Katie soon saved enough money to build a bungalow and start their own business. John recalled that Germans weren't liked very much at the time and he was advised to change the spelling of his name from Pauly to Pauli. And so he did. In 1908, John began delivering sweet butter, eggs, and poultry from house to house using a horse and buggy. He had a large bell which he would ring as he went down the streets. The chickens were dressed in the basement of their home at 424 Morris Street (now 616 NE Morris). Before World War I, the butter and eggs were shipped from Skamakowa, Washington to the Albina waterfront. Stamp found in a book owned by John Pauli. Courtesy of Pamela Pauli. Having settled into their new home, John and Katie started a family which grew to four children: John Jr. (born February 1911), Lydia (born September 1912), Mollie (born Jan 1916) and Henry (born June 1917), All of the children were baptized at the Ebenezer German Congregational Church. John became a citizen of the United States in 1915. The Pauli's were known for their generosity. Katie's garden was described as "a veritable sunburst of beauty that brought joy to all who passed by". Katie was also known to be an avid baker and much of her work was for the benefit of others. She sent John out weekly to deliver baked goods and flowers from the garden to those in need of nourishment and cheer. In the early 1920's, a severe famine ravaged the Volga region and the German colonies. The Iron Curtain was closing. Katie's parents and siblings faced starvation. John and Katie sent money to assist the family but it was always confiscated by the Soviet authorities. They tried twice to bring the Hamburg's to Portland. The second time they paid a shipping agent for the cost of their passage, but later learned that the money had been stolen and never reached the Hamburg's in Russia. That was the last time John and Katie heard from them. For the rest of their lives, they lived with the anguish of not knowing what happened to their family members who remained in Russia. John's business continued to prosper and in 1923 he was the registered owner of a Hupmobile. He also owned a Ford delivery truck which was registered in 1917. John Jr. married Emilie Rueger on March 31, 1932. Emilie's family was also from Russia. In 1940, John borrowed $2,500 from Mrs. Wolf and bought the Crescent Poultry Company located at 532 SW Front Avenue (the two story commercial building was demolished to make way for Harbor Drive). After 1 year and 3 months, the company moved to a new location at 322 NW Everett where they remained until 1951. Both sons were active in the family business. 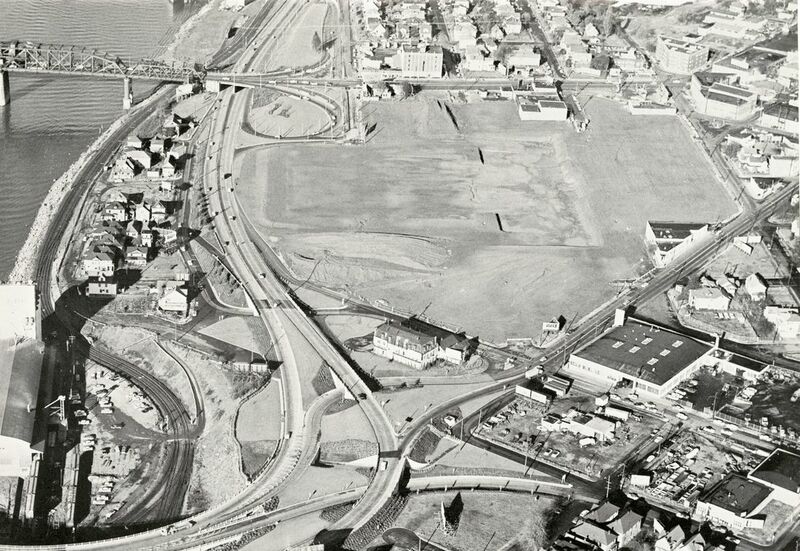 In 1951, a new facility was built at the intersection of McMillen and Benton in NE Portland. The new building cost $25,000 but was short lived. In 1957, the development of the Veterans Memorial Coliseum forced them to sell the property and the site was cleared. John decided to retire at the age of 74. 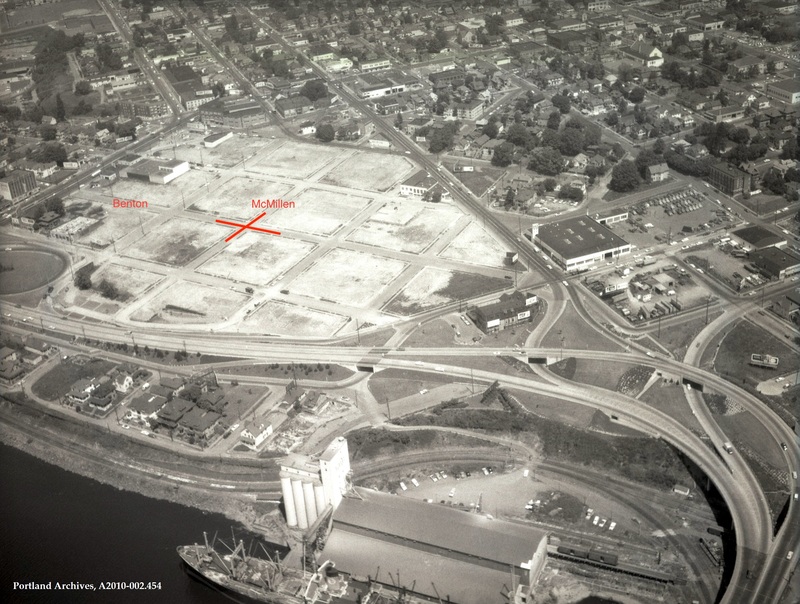 View of the Memorial Coliseum site showing the old street system and location of the Crescent Poultry Company at Benton and McMillen streets. Source: City of Portland Archives, Oregon, A2010-002.454. Image edited by Steven Schreiber to show the former street locations. View of the Memorial Coliseum site before construction in 1959. Source: City of Portland Archives, Oregon, A2014-003.934. ​John and Katie celebrated their golden wedding anniversary in 1956. At that time, they had 11 grandchildren. John Pauli Sr. died on September 20, 1959 in Portland. Katie died on December 2, 1962. Both are buried at the Rose City Cemetery. John Pauli Jr. continued in business as Pauli Packing Company which provided cured and smoked hams and bacon, rendered lard and sausage. The operation was originally located on Lombard Street and later moved to 81 NE Columbia Blvd in the early 1930's. Obituary for John Pauli published in "Der Kirchenbote" Vol 78, #5, December 3, 1959. FamilySearch.org obituary collection. Katie Pauli Memorial Card. FamilySearch.org obituary collection. 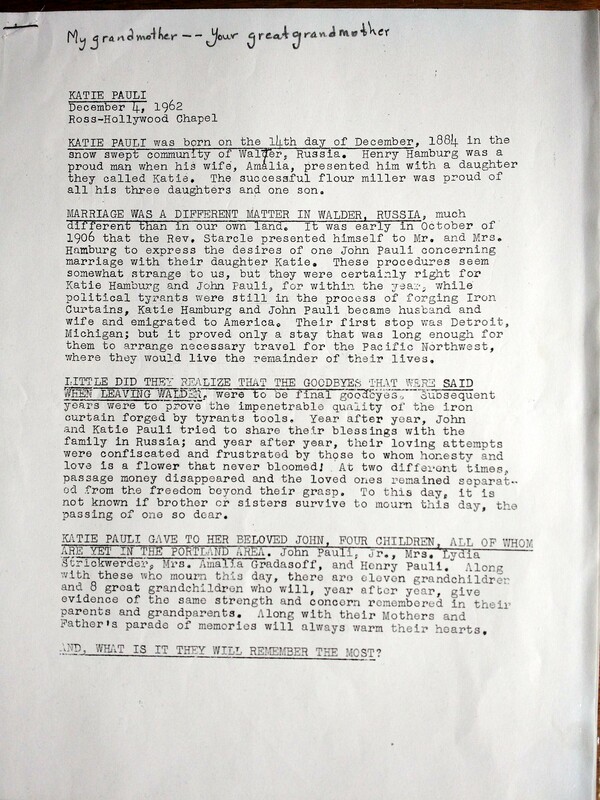 Katie Pauli Memorial Service handout dated December 4, 1962. Courtesy of Melody Wolff (née Strickwerda). 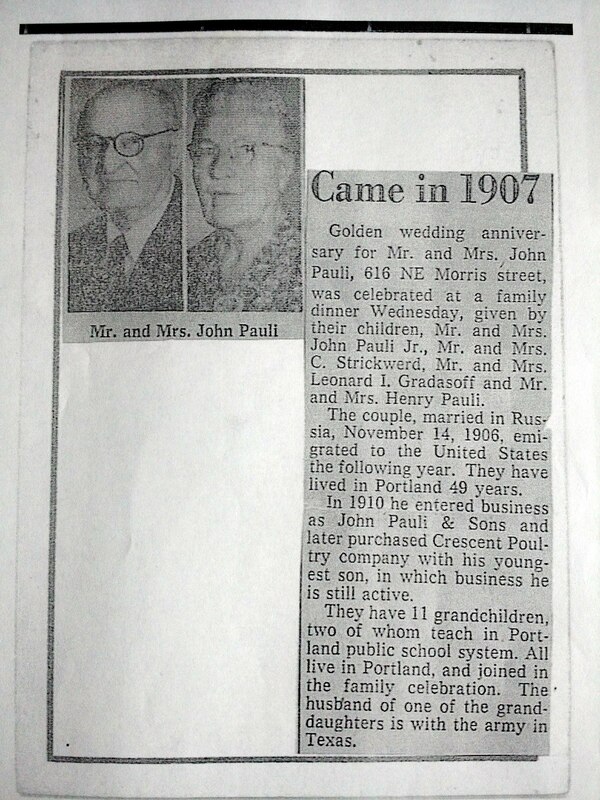 Mr. and Mrs. John Pauli Golden wedding anniversary newspaper clipping, 1956. Krieger, Joanne, trans. Ebenezer Congregational Church, Portland, Oregon 1909-1984. Portland, OR: 2002. Print. Pauli, John Jr. 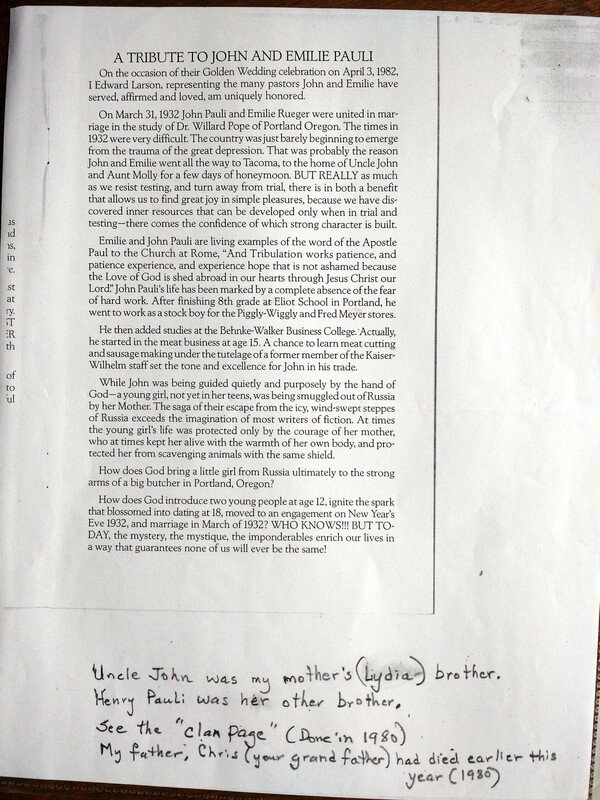 Oral history of the Pauli family as told to, and recorded by, Velma Pauli, the wife of John Jr.'s brother, Henry Pauli. Courtesy of Melody Wolff (née Strickwerda). Larson, Rev. Edward. "A Tribute to John and Emilie Pauli - On the occasion of their Golden Wedding celebration on April 3, 1982." Courtesy of Melody Wolff (née Strickwerda). Last updated December 16, 2018.